So, for this one I thought I would add some step-by-step images, mostly since it was quite some time since I did one of those things. I called this piece “The Final Resting place” for obvious reasons, and the style differs quite a bit from what I usually do. But since there are no machineguns or laserpistols lying around I feel pretty good about it. That way it didn’t look too much like a metal-album-cover. Or..? Now some of the steps I’m going through, if not all, is obvious and maybe not all that interesting for everyboy – but for a beginners it might be helpful. The tips I provide here is what works good for me, and is not at all a guarantee that it would fit your creative style / pipeline as it does mine. I have noticed I easily get to excited to start rendering, and have learned that posting images of this on various media helps a lot. While awaiting critique and comments you have time to start thinking of the next step. Like environment, lighting conditions, backstory.. Anything that might help add to the depth of the final image. I finalized the piece, knowing that I wanted to cover most of the character under debris and crap – I knew that this would suffice. 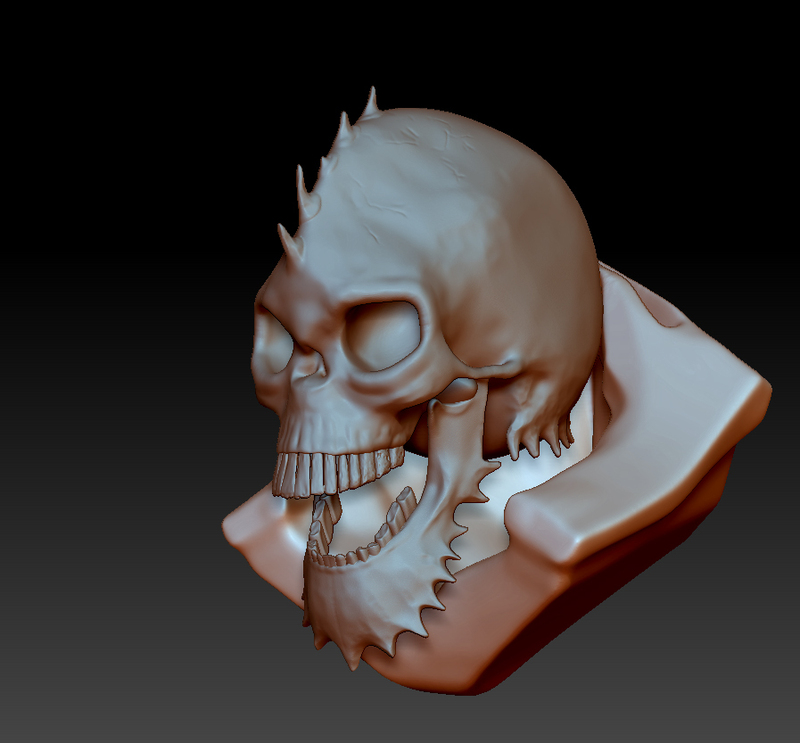 So I Zremeshed all pieces (I am in love with this new powerful tool inside Zbrush), and polypainted them. Exported them along with displacement maps and the lowpoly models into Cinema 4D. Then I set up a camera, that was somewhat the way I wanted it – by framing the model in this fashion I know exactly how much I would have to add to the scene. Often one can model and texture for hours, pieces and sides of objects that never get seen in the final piece. So I went back into zbrush, quickly sculpted some objects, and the rest I took from the standrad insert-mesh-brushes that came with Zbrush, and some I downloaded from the Pixologic forum thread about multi-mesh-brushes. People are great at creating intuitive and imaginative brushes… It blows my mind. 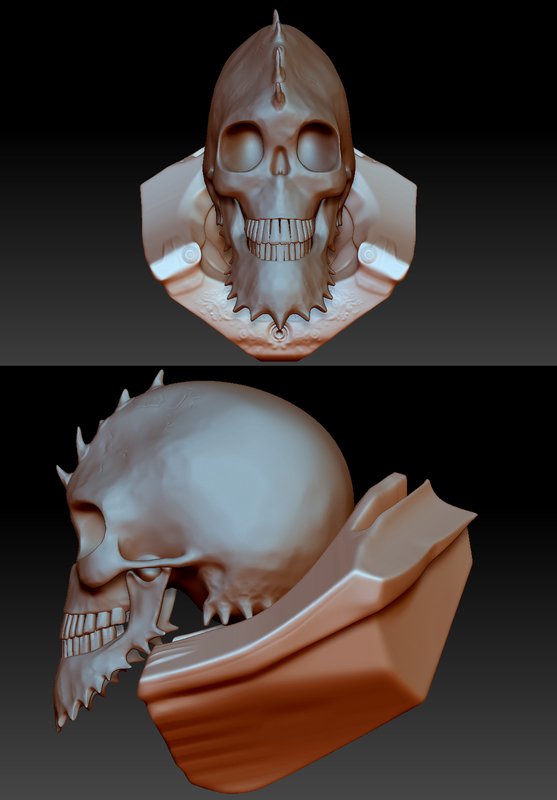 Some of you Zbrushers probably can spot some of the meshes I used. So now is the time to try to back off once again – otherwise I’ll be too hasty and probably mess it all up. So now I rendered this image above, and then during lunchtime, I looked at it. Inside photoshop I did some quick and hard to read “adjustments”. So later when I came back to my project I started to fix it all. During this time I also got some ideas for improvement in other not mentioned ways. Still some objects will disappear and some will be added. Continuing the process until all is textured. At this point I really got tired at the big clumsy objects to the right. So I scrapped them. The cloth in the background I quickly painted a made-up logo in photoshop, and applied to it. From this point it was all straight forward until compositing in photoshop. I hope this was helpful to some, fun for others and not toally boring for anyone! If you have any questions, feel free to post’em. 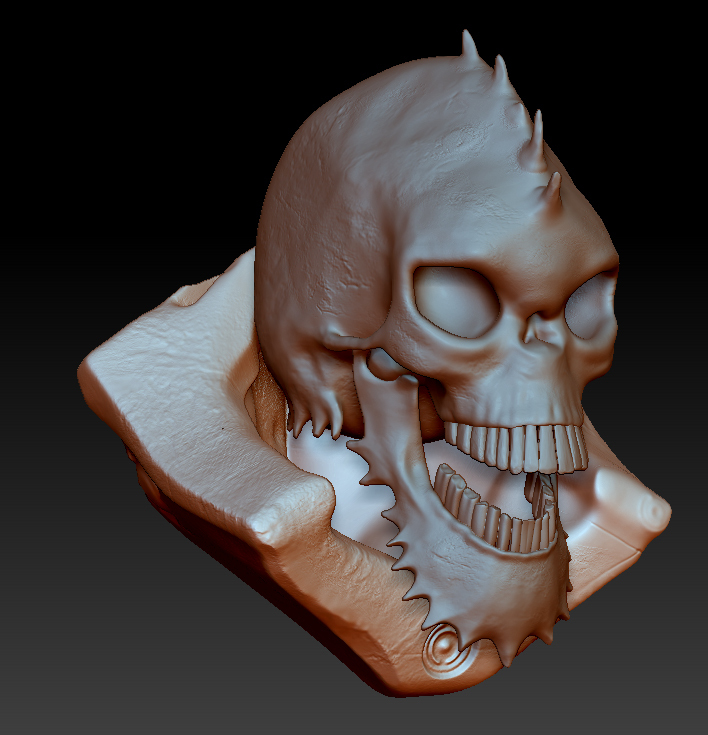 Happy sculpting / modelling / texturing! Thanks Steven, glad you like it!